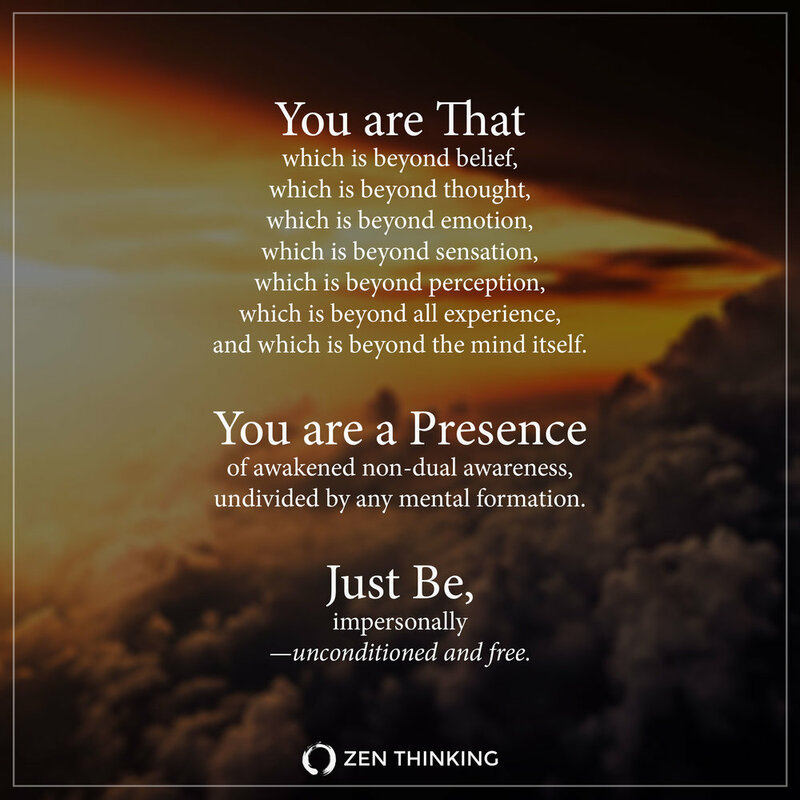 You are here for one thing—to shed the egoic skin that veils the knowing of your true Self, and to awaken to the non-dual presence of your Being. Cast off the many layers of false beliefs that confuse you. Disregard the thoughts appearing to you, knowing that none are the truth you seek and quietly abide in the infinite silence in which they appear. Discard your behaviour of creating stories about this idea you call “me”; it alone is the cause of your dissatisfaction. The habit of nurturing and protecting this delusional mental image of yourself is what binds you to a personalized world of unhappiness, discontent and suffering. No longer believe yourself to be something you are not and don't assume that others are as you think them. No longer trust that the world is as it seems. The truth is, nothing is at it appears. All that you see is a projection from the fearful mind that is conditioned to define itself by things it believes to be outside itself, by creating concepts to which it is opposed, in which it can somehow hope to create some self-meaning. But “me" is merely a thought, and a thought cannot think, so... for what are you searching? And, who is doing the searching? How much longer will you wait to realize that peace is ever-present? It only needs to be realized, by emptying yourself of all untruths. Your well-being is here and now, it has never been elsewhere. The truth is, you have never actually lost your inner peace, you have only forgotten it. Realize that there is nothing other than the absolute perfection that is here and now, which you hesitate on self-realizing, which you ponder, question, and then altogether ignore, and which you then dream of being somehow better. You exist, that is certain—but, as whom? Or perhaps more precisely, as what? No longer search for answers. Investigate your own nature—the subtlety of your beingness that is self-aware, regardless of the situation. Know yourself not by a concept, but as the presence of knowing that is aware of this present moment. You are pure awareness; while everything you experience is an impermanent appearance of mental form dancing within your otherwise infinite and spacious expanse. When you narrow your awareness onto how a thing appears, and you become hypnotized by the labels and concepts which you attach to them, your world becomes limited and small, as does your sense of self. But if you widen your awareness and allow everything to be as it is, free of concepts, then your world becomes free of the mind's notions whose only purpose is to divide and distract you from your otherwise perfect presence of being. Realize that there is only this unadorned Presence, which you animate with your breath, by which you can only know through all of the things that arise within consciousness. You are already effortlessly and infinitely aware—which is the very enlightenment you seek—but you insist on bringing all of your mental and emotional baggage along with you, thereby distracting you from the Absolute Reality which is always here. Everything that you see, think, believe, and feel, including all of your problems and emotional pain, are merely mental projections appearing onto the blank screen of awareness, which is your true Self. No longer be fooled by imagination. Fret not with any of the images that dance across the screen of consciousness, regardless of their form, and regardless of how real they may appear. Realize that anything other than the blissful emptiness of your Presence is nothing but a false reflection of the ego—a projection of mind. If you believe the opinions that the mind places on things, then you become deluded by the ego, which causes you to mindlessly react to its false concepts, which will only drag down into further suffering. In other words, what you take as being real is, in truth, an illusion created by the mind. The antidote to this delusion is to awaken to awareness. See your layers of conditioning for what they are—a set of unchangeable life circumstances that have constructed the walls of the dreamworld in which you seem to exist, that confine you, in which your mind toils, and which now challenges you to awaken from entirely. Your life's challenges are not to be changed or solved; you are to awaken to their false reality—you are to transcend them. Your struggles are there to poke and prod you, over and over—to wake you up—until you realize that it is the clinging to their illusion that causes them to persist. The solution is quite simple. Let it all go. Leave the world alone. Leave others alone. Leave yourself alone. Be quiet. Be still. Sink into your emptiness, where the bliss of Absolute Nothingness permeates all forms that arise within it. You are That which is beyond belief, which is beyond thought, which is beyond emotion, which is beyond sensation, which is beyond perception, which is beyond all experience, and which is beyond the mind itself. You are a Presence of awakened non-dual awareness—undivided by any mental formation. Just Be, impersonally—unconditioned and free.